I am pretty sure that if you search hard enough, the Cydia store will be able to produce an extension or tweak for pretty much any kind of situation that you can image. It is literally packed to the rafters with packages, with revblaze’s HTML Editor being one of the latest commercial apps to land on the ModMyi repository. We aren’t going to offer any prizes for guessing just what this piece of software does, the name of the app gives the game away, but it does serve as an extremely functional and powerful mobile editor for those who deal with, or like to tinker with Hypertext Markup Language (HTML) on a regular basis. A mobile-based installation such as this will obviously never replace a standard text-based editor on a Mac or Windows PC, nor will it replace development environments that coders may use to write their HTML. It does however work extremely well for its intended purpose – editing and viewing HTML on the go. HTML Editor actually has quite an accomplished feature set; allowing users to view, modify, create and share HTML code directly from their jailbroken iPhone. The easy to navigate interface provides a very simple outlet for web programmers, meaning that editing a section of code should be relatively problem free with the added bonus of being able to quickly share that code, whether it be by email or a service such as Instapaper. One of the more advanced features of the HMTL Editor package is the inclusion of multiple HTML shortcuts, making working with and organizing code on the iPhone a lot simpler. The built in functionality enables users to view the code through a web view or on the device is also something that should appeal to a large set of users involved in mobile web development. 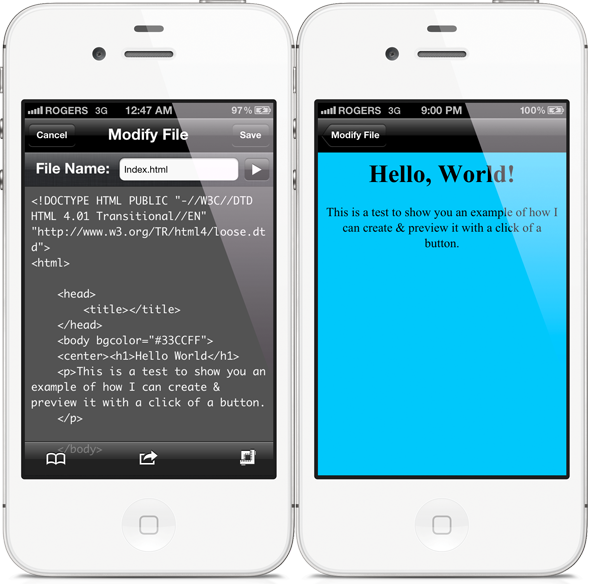 HTML Editor is available from the ModMyi repository at a cost of $2.99.